I have to admit, I was not all that excited by the prospect of a new Gears of War title. Don’t’ get me wrong, I am a fan of the series—a big fan—but the prospect of a prequel just didn’t sound that appealing. Prequels are inherently limiting, and the story is always going to be forced into the confines of the existing narrative. It might be interesting to see Sera before the Locust completely smashed it, but there is still a limit on the plot. After seeing the game and learning more about it in a closed door session at E3, consider me a true believer. 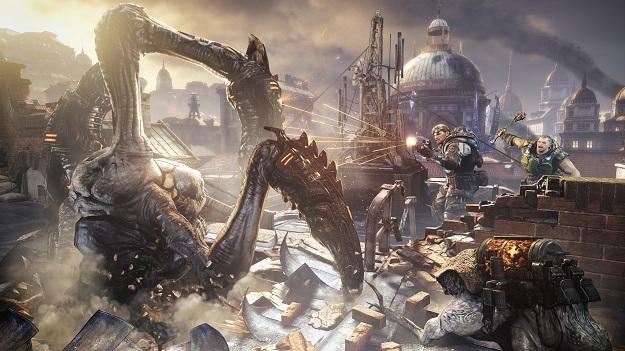 The game takes place 14 years before the first Gears of War, shortly after the first appearance of the Locust on Emergence Day. The game focuses on the familiar faces of Baird and Cole, who make up part of Kilo Squad. Joined by two new characters—a straight edge elite Onyx Guard and a refuge of the URI—the squad is charged with a litany of crimes, including treason. The game is then told through a series of flashbacks as the trial makes up the framework of the story. But beyond being part of the narrative, this actually becomes an integral piece of the gameplay itself. Each mission you play through will feature “classified” information that appears as blocked out sections of text or items that can’t be fully seen. To unlock these things you will need to complete certain objectives. These classified segments promise to add to the story as you learn more about what is going on, plus it should increase the replay value. And speaking of the replay value, that is what makes this game really stand out. Every time you play through Judgment, it will be different and unique. The game will learn your skill level and match itself to your abilities. It will also constantly be changing itself. Rather than attacking the same enemies in the same location, if you replay a segment, the enemies could completely change. They may be in different locations or there may be a different type of enemy there altogether. No two playthroughs will be exactly the same. There will also be a huge emphasis on the challenge. So much so that developers Epic Games and People Can Fly are promising that only the casual mode will be even remotely easy. 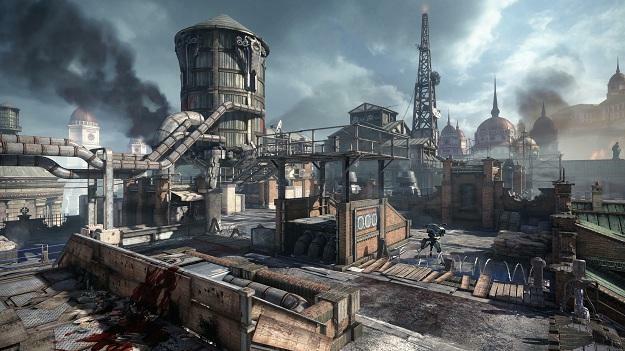 This will be the most challenging Gears game by far. 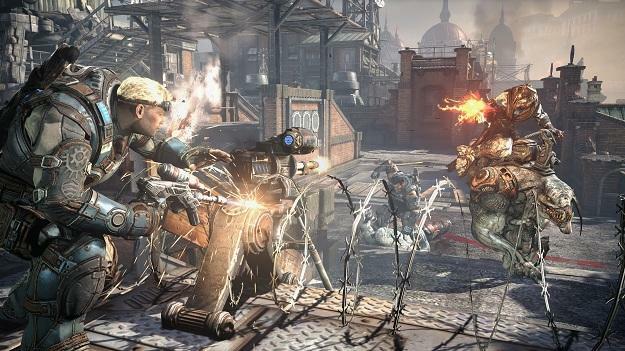 To begin with, there will be more Locust on screen than in any of the other games so far—including Gears 3, which often had an overwhelming number of enemies at any given time. Judgment will be intense. There will rarely be a moment to breathe, and progressing will not be a simple thing. You will need to earn it. The game Dark Souls was mentioned more than once if that gives you any clue. In order to help you survive the onslaught, there will be a slightly new control scheme. How significant these changes are remains to be seen, but after three very successful games, it will probably be controversial. Along with the new campaign, the game will feature a full and complete multiplayer offering, including a new mode called “Overrun.” Overrun is essentially Horde mode combined with Beast mode. and it will feature 5v5 play. The COGs will be on the defensive, while the Locust will be attempting to destroy the COG generator. The COGs will now be assigned classes, and each class will have its own abilities. If you choose to be an engineer, you will be able to repair fortifications; the medic class can heal and revive; the soldier can drop ammo boxes; the scout can access areas that they alone can go, then mark enemies they see. On the other side, the Locusts will play like Beast mode. The more points you earn, the better Locust classes you can call upon and control. Teamwork will be key, and not just for the COGs but the Locust too. There will even be things you can do as a team that may not seem obvious. One example mentioned was having a small Locust eat a grenade, then have a larger one kick him over fortifications into the middle of the COG base where it will explode like a bomb. There are several possible combinations available, some of which are intentional, others are meant to be left to the most creative players to invent.